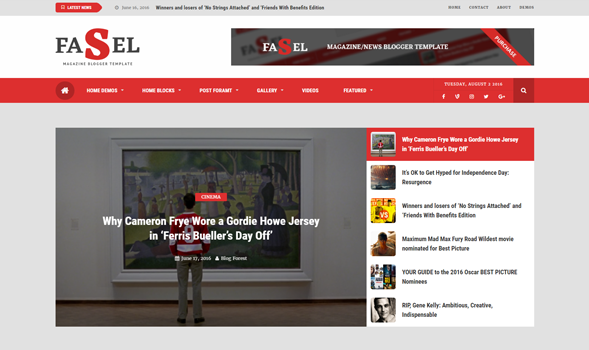 Fasel is a Responsive Blogger Template designed specially for Magazine and news based websites and blogs. It gives your site amazing touch, look and feel. One time payment, Amazing 30+ Features, 10 Homepage Layouts, Remove Footer credits, lifetime support, Regular updates and Much more. 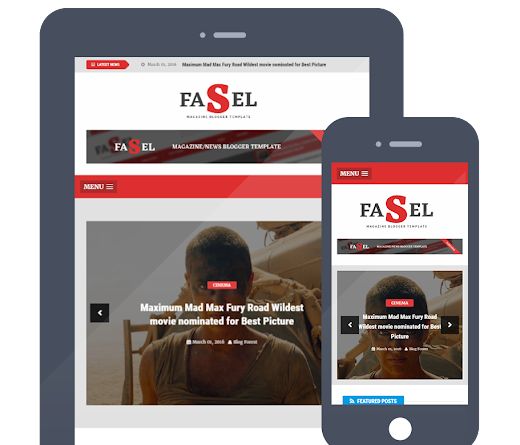 Fasel is a Responsive Blogger Template designed specially for Magazine and news based websites and blogs. If you're looking to give your Blogger site a whole new look, touch and feel then Fasel Blogger Template is a perfect choice. It was built to support wide-rage of blog niches like fashion, lifestyle, travel, decoration, technology, multimedia, and personal blogs. It has a very clean and minimal design and follows latest design standards. Fully Responsive Design: Just like our previous released Viral blogger template, this theme has full support for responsive design and works perfectly on all devices including desktop, smartphones, laptops and tablets. Powerful Admin Panel: Are you a non technical person? 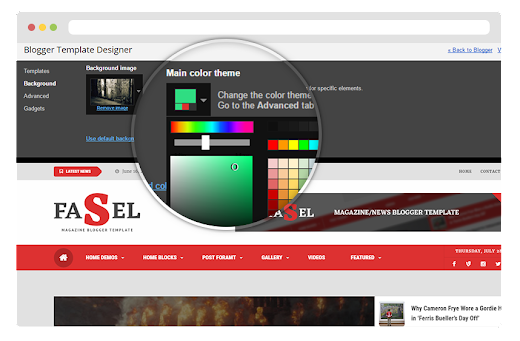 Fasel is a very user-friendly blogger template that provides a powerful admin panel with professional options to customize your blog without editing any codes. Unlimited theme colors: If you don't like default colors, you can always change them with just a few clicks. 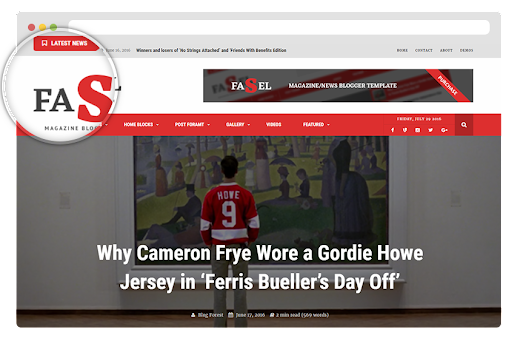 Fasel allows you to customize color combinations using color pickers so you can make your site stand out. 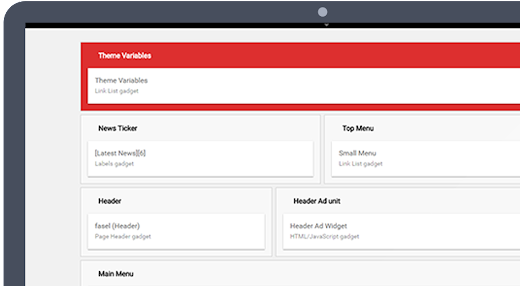 +10 Custom Widget: Fasel comes with 10+ custom widgets that are never seen before on any other Blogger Template. It supports customization and can be used through shortcodes. News Ticker Plugin: Fasel also provides a robust news ticker allowing you to display your most hot articles. SEO Optimized: Fasel Blogger Template is highly optimized for search engine with powerful SEO and clean code. Optimized for Social Sharing: To make your site highly visible on a social platform, we have made this template highly Social friendly. It works great with open graph and twitter meta tags. 2 Blog styles : This template also comes with 2 different blog style, you can either choose classic or modern blog style. Fasel also comes with a Free version which can be downloaded and used for FREE. Although it does not provides same high quality features like Paid version, but it is certainly a lot better choice than an almost majority of Free blogger templates. Only one blog style, and there's no option to change it. We hope this blogger template would turn out to be useful. It is indeed a great Paid and Free multipurpose Blogger template for your site and blogs. Please let us know what your thoughts in the comments below.